Was reading an interview of Sri Martand Mhalsapati, the son of Mhalsapati, the devotee of Sai Baba who accompanied Sai Baba most of the time and also slept with Sai Baba in Masjid (Dwarkamai) and Chavadi. Martand Mhalsapati's age was around 100 years while this interview was taken. On questioning about how long he served Sai Baba the answer was that he served Sai Baba with his father (Mhalsapati, Much known devotee of Sai Baba) till the age of 45 years. One of the questions put to him was that It is said that Sa Baba was never seen sleeping. They say that He was always awake! What would you like to say? Satka : (Short Stick which Sai Baba always use to keep with him, one of which was presented to Mhalsapati, and can still be seen at Mhalsapati's home in Shirdi and other one is kept in Samadhi Mandir (Temple) and on every Thursdays kept with Sai Baba's footwear at the feet of Idol with the picture placed in Chavadi, all of this taken in a huge procession after the night Arati, from Samadhi Temple to Chavadi again). The posture of head resting on hand in half lying posture brings the similar posture of lord Vishnu shown in pictures, that of Gautam Buddha and few more enlightened souls. 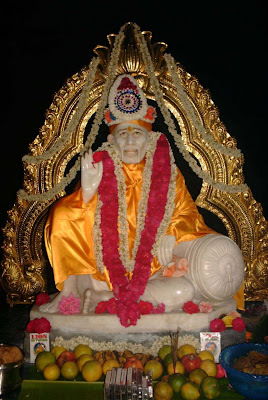 Also Sai Baba of Shirdi is known for the unique, miraculous, activities. Which brings to the mind the mention of Sai Baba sleeping on the plank of wood suspended, on the ceiling of the Masjid. In Sai SatCharitra it is stated that " Mr. Nanasaheb Dengale brought, for Sai Baba, a wooden plank, amount 4 cubits in length and only a span in breath, for sleeping upon." :) this brings to mind, that what was it that inspired Nanasaheb Dengale to bring such a piece of wood to sleep upon and seeing the size mentioned, it would in no way a comfortable place to sleep on. And Sai Baba, no wonder he was consider Crazy Fakir in the beginning and even afterwards by very few, accepted and hung it like a swing with few slender pieces of torn clothes. Das Ganu Maharaj another eminent devotee of Sai Baba of Shirdi, who had witnessed Sai Baba sleeping upon this plank wondered how the plank was suspended so high i.e. about 7 to 8 feet above the floor and 1 to two cubits below the roof. We can still see the place where it was hung in Dwarkamai it we care to look upward just after the Dhuni ends and in front of the Nimbar. Also it is mentioned that four earthen lamps were put loosely on the four corners of the plank. The strength of the rags with which the plank was suspended were just good enough to bear the weight of the plank and the earthen lamps placed on them. This shows us the command of Sai Baba over his physical body. Firstly it would have needed aviation of the body to reach on the plank, and also aviation required to stay on the plank looking at the strength of the rags that supported the plank, also the loosely put earthen lamp would fall down on the slightest swing we can assume. Sai Baba would have been staying there with aviation of his physical body and bestowing grace for his devotees from there. Naturally after few people of Shirdi including Das Ganu saw Sai Baba sleeping in this unusual manner, people began to wonder how Sai Baba climbed up the plank and came down but none could discovered it, upon people trying to see this wonderful and miraculous feat, Sai Baba one day got enraged and broke the plank and threw it away and continued to sleep(?) on the floor. Also mentioned in Sri Sai SatCharitra chapter 45 "Once Baba was describing the greatness or importance of this plank to Kakasaheb. Hearing this the latter said to Sai Baba "If You still love the wooden plank, I will again suspend or hang up one in the Masjid again for You to sleep at ease." Sai Baba replied - "I won't like to sleep up, leaving Mhalasapati down on the ground." Then Kakasaheb said "I will provide another plank for Mhalasapati." Sai Baba "How can he sleep on the plank? It is not easy to sleep up on the plank. He who has many good qualities in him can do so. He who can sleep 'with his eyes wide open' can effect that. When I go to sleep I ask often Mhalasapati to sit by My side, place his hand on My heart and watch the 'chanting of the Lord's name' there, and if he finds Me sleepy, wake Me up. He can't do even this. He himself gets drowsy and begins to nod his head. When I feel his hand heavy as a stone on My heart and cry out - 'Oh Bhagat', he moves and opens his eyes. How can he, who can't sit and sleep well on the ground and whose asana (posture) is not steady and who is a slave to sleep, sleep high up on a plank?